Fashion design is not just for fashionistas but can have many different applications across a diverse range of industries, opening up an exciting range of career opportunities, according to University of Ulster academic Janet Coulter. The Industrial Fashion designer who is based in the School of Art & Design, has been collaborating with Windflow, a Crumlin based start-up company established by Michael McPeake, to develop a windsock to help racing greyhounds run faster. Michael, who has extensive experience of rehabilitating dogs from muscle injuries, took advantage of the Invest NI’s Innovation Voucher programme to tap into the University of Ulster’s technical expertise and turn his good idea into a unique product with export potential. Janet has worked on numerous other novel projects but this was her first time to work with greyhounds. Funded by InvestNI and Enterprise Ireland, the Innovation Voucher Programmes offer small businesses support worth up to £4,000 (€5000 in the Republic of Ireland) to collaborate with universities and colleges throughout Northern Ireland and the Republic of Ireland to access innovative business solutions. Michael McPeake said: “Windflow’s collaboration with the School of Art & Design has helped us develop a unique product for the global marketplace. We were able to use an Innovation Voucher to draw on Janet’s design and scientific expertise to establish the drag co-efficient required to give full performance and functionality to the design. 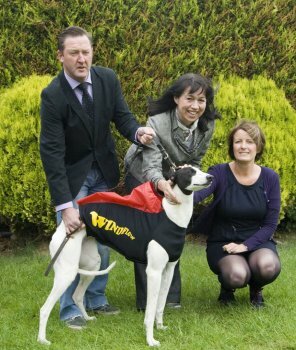 “The windsock coat was designed for trainers to use as part of the dogs’ training regime. It is an innovative solution to help the dogs run faster by bringing them to peak performance in a gradual and controlled way. The Innovation Voucher programme at Ulster is managed by the university’s Office of Innovation. Other projects to receive assistance from the University of Ulster under the Innovation Voucher programme include: fire and skid resistance testing, product and package design, the design of recycled plastic structures, research into the sterilisation of healthcare devices, the development of a communication and policy engagement strategy and the testing of a new mind mapping e-learning package.